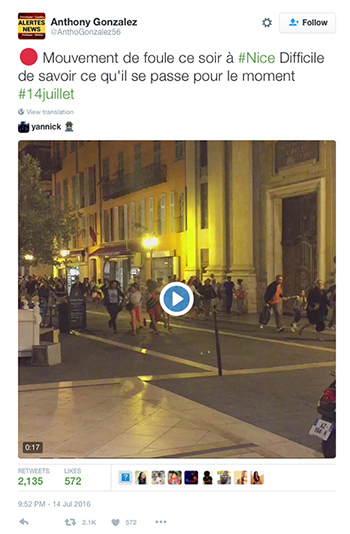 This blog post and a follow-up next week analyse Twitter activity following the terrorist attack that took place in Nice, France on 14 July, 2016 and associated real-world events during the ensuing week. It is part of a larger project exploring hashtag activism in CVE. This first posts traces the online reaction to developments during and in the first 20 minutes immediately following the attack. The attack in Nice occurred shortly after 10:40pm on 14 July, 2016. Mohamed Lahouaiej Bouhlel drove a 19-tonne truck through a crowd of over 30,000 people watching a Bastille Day fireworks show along the Promenade des Anglais. He drove for nearly 2km until he was caught in a firefight with the police, which led to his death. Eighty-four people died in the attack and 303 were injured. Bouhlel was identified shorty after when investigators found his identification during a search of the truck and his belongings. This case study analyses a corpus of tweets associated with the terrorist attack in Nice utilising machine learning software, Method52. Over 6.8 million tweets (n = 6,876,2640) were collected over a one-week period spanning 13 July 13 to 21 July 21. A query-based search was conducted first utilising the term “#nice.” Due to the double meaning of the term, the results of the first query were analysed to compile a list of the top associated hashtags used in association with #nice that were related to the July attack. A total of 17 hashtags were collected and used to run a broader, multiple query word search for the one week period of interest. These hashtags were widely employed by users across multiple languages and around the world. During the one-week period of collected tweets eight moments of heightened Twitter conversations were identified that were associated with the top 10 hashtags. The most intense moment took place in the immediate hours following the attack. A second significant moment occurred in the early hours of the day following the attack. In the subsequent days the tweet waves were less intense overall and plateaued by the fourth day after the attack. Due to the quick rise in Twitter activity in the immediate aftermath of the attack, the first hours of tweets were analyzed in 20-minute segments beginning at 10:40pm. 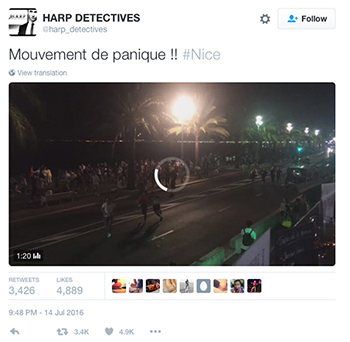 In the first 20 minutes, the majority (81.42%) of the tweets collected (n = 3,041) were not associated with the attack in Nice, but instead were related to the ongoing Bastille Day celebrations. Bouhlel drove from a starting point near the Negresco Hotel (at the bottom, left corner in Figure 3) along the Promenade des Anglais towards the old city (at the top, right corner in Figure 3). 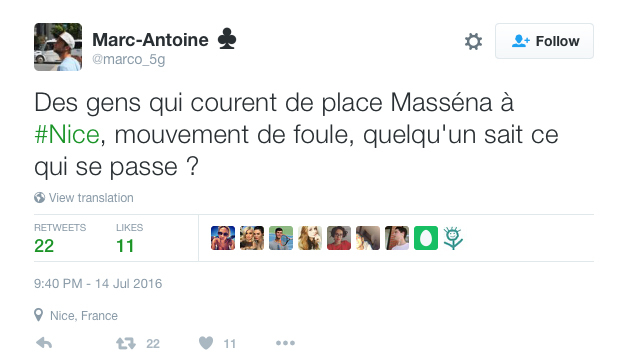 Some witness accounts seem to relay information from points near Place Massena (indicated by the red marker in Figure 3). These initial tweets did not generate much of a response. However, another witness (@LoreVonRo) sent out the second tweet in the data related to the attack at 10:40:44pm, and she began to gain attention from journalists wishing to gather more information on the attack. This user continued to send live updates, and a tweet she sent out about 5 minutes after the attack at 10:45:25pm included a video. This tweet elicited the attention of 17 journalists associated with newswires and major news agencies, including the Associated Press, ABC, CNN, Agencia EFE, and Storyful. The most retweeted tweets during the first 20 minutes into the attack were those by witnesses (Table 2 below). In fact, a closer look reveals that the witnesses and tweets that gained the most traction were those who provided continuous updates and included photos or videos. Half of the top ten most tweeted tweets included videos, which were subsequently picked-up by multiple users associated with the mass media and then recirculated across various media platforms. 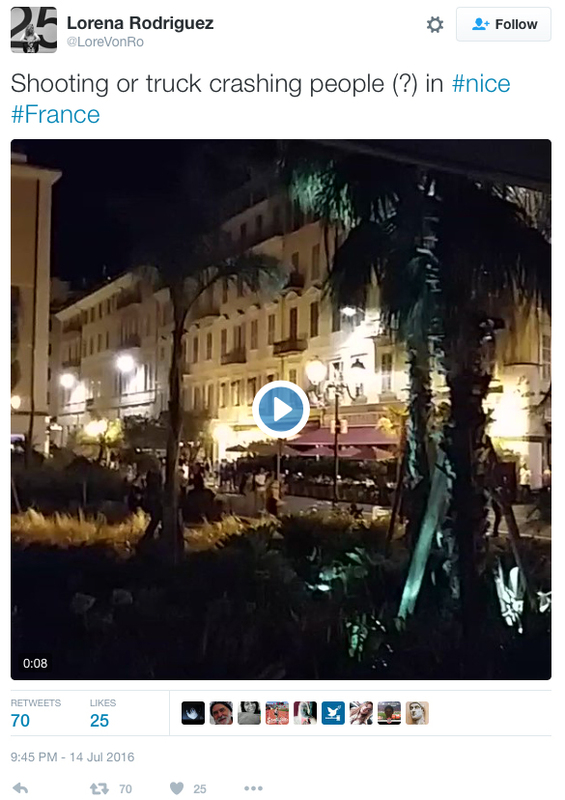 BREAKING: #Coups de feu entendus à #Nice, la foule paniquée fuit en masse! It’s worth pointing out that the seventh entry in Table 2 is associated with an emergency account of the French National Police. Given the crisis and disaster communication framework of my larger project, there is an interest in tracing how prominent first responder- and community organization-type users are in the aftermath of attacks. The top two tweets that received the most circulation included videos that were later widely used by various news media agencies (Figure 7).